If you haven’t heard, Minnesota’s known for its tens of thousands of lakes and massive wooded spaces – heck, there better be room if there’s a fabled giant, plaid shirt-wearing lumberjack and his big blue ox buddy living there! With that said, it only seems natural to make the most of all that beautiful lake shoreline. Ya, you betcha our list of Top Minnesota Cabin Resorts will make you want to flock to this North Star State. And we promise you’ll have a Minnesota Nice time, too! Gunflint Lodge is one of the premier destinations of the Minnesota North Shore. That's because it's right in the heart of the best that the Northwoods have to offer. If you're a fisherman, then a chartered fishing trip on Lake Superior is just what you need. If you're a hiker, biker, or kayaker, then the several State Parks in the area are your playground. In the wintertime there are 200 kilometers of cross-country skiing trails for you to enjoy as well. Any time of year, there's just so much to do. 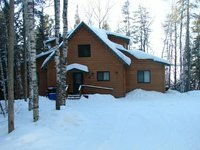 And if you ever get tired of all those fun activities (as if that were possible), you can always come back to a luxuriously appointed cabins at Gunflint Lodge. The cabins boast fireplaces, whirlpool spas, saunas, washer/dryer and are finished in stunning Northwoods hard wood style. They can be a cozy home away from home and you just won't want to leave! You can get meals delivered right to your door, and if you need some serious relaxation, Gunflint Lodge now has a massage therapist as well! In wintertime there are 200 Kilometers of cross-country trails for you to enjoy! The Gunflint Northwoods Outfitters store is onsite and has everything you need for any outdoor adventure. Get the gear and guidance you need! We know we gushed about how cozy and secluded our last pick was, but it may have met its match at Pine Terrace Resort. Brightly shining as the only resort on Star Lake, this Northern gem has solitude down to an art. Of the 13 homey cabins Pine Terrace offers, we couldn’t help but to fall in love with the Gola Cabin – the original structure that was built by the founding owners at this Cross Lake, MN location. This quaint one-bedroom cottage is a rustic dream for lovey-dovey honeymooners and anyone who wants to spend a lot of time in close yet comfortable quarters with one another. It’ll be hard to rip yourself away from your love den, but you’re not going to want to miss out on the exhilarating Star Lake adventures. Being the only resort on the lake, you won’t have to deal with irksome high boat traffic or oversaturated fishing spots. Nope, the waters are yours to launch your trusty boat into and cruise. And don’t even think for a second that you won’t be coming back to shore without a stringer full of largemouth bass, northern pike, sunfish and crappies! Pine Terrace Resort has its own easily-accessible private boat ramp! Star Lake is 150 acres and has a maximum depth of 84 ft.
Pine Terrace Resort offers two all-season cabins that include a fireplace, screened porch, sundeck and two baths. Discover a rustic retreat every month of the year at Gull Four Seasons Resort, where a bevy of Brainerd attractions combine with cozy cabins with an array of amenities. Whether you're cruising along the lake, exploring the lush wilderness, or relaxing in the cabin, you're sure to enjoy this secluded stay! The fun starts just outside your door, where Gull Lake teems with entertainment. This angling oasis attracts fishers from all over the country, as you can hook trophy walleye, northern pike, and panfish. It's easy to get around on the water, as the resort offers boats, pontoons, and motors for rent. If you'd prefer to stay dry, hike through the lush landscape in the summer and snowmobile or snowshoe the snowy terrain in the winter. When you're not exploring, soak in the simple life on the property, where heated indoor and outdoor swimming pools await. Fresh Wi-Fi keeps you connected while welcoming cabins offer a place to kick up your feet. One- to five-bedroom cabins can fit families of all sizes and feature cable television, a game room, and HDTVs. This lakeside getaway combines exploration and relaxation! When you're not soaking in the serenity of the resort, hike the Paul Bunyan Trail, line up your putts at Pirates Cove Miniature Golf, or swing away on any of the 14 nearby golf courses! The swimming beach is just outside your door, offering a place to build sand castles, catch a tan, or dive in for a swim in Gull Lake! This all-inclusive resort on the Gull Lake narrows, supplying access to the entire Gull Lake chain, offers a four-course fine dining experience, exquisite wine selections, and a full breakfast off the menu. Lost Lake Lodge is an unforgettable escape, situated on two lakes in Minnesota's northwoods. 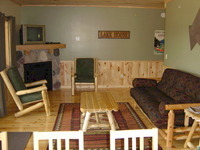 The lodge rests between private Lost Lake and the Upper Gull Lake chain, a paradise for fishing and boating. Nature trails wind through ancient burial grounds, where you can spot deer and over 44 bird species. Venture out in a canoe, water bike or kayak among the loons. A spectacular restaurant serves food made from the freshest ingredients. The genuine combination of nature, golf, spa services, and warm accommodations make this a truly magical Brainerd lakes getaway. It's the perfect way to escape to nature without roughing it! Family fun never runs out at Lost Lake Lodge. This exciting Minnesota destination welcomes you and your loved ones to reconnect in a relaxing lakeside setting. The kids will love building sandcastles on the beach, or spending an afternoon swimming in the shallow end of the lake. For even more fun, you can rent a boat for a day of fishing. Family-friendly activities also extend to hiking trips, an onsite playground, and outdoor games like basketball and horseshoes. Top off your day with a relaxing campfire on the beach! Nelson’s Resort sits on the edge of Crane Lake. But we promise, there won’t be a need to crane your neck for an unmatched view of more than 40 miles of continuous waters, all waiting for you to explore! Not that the other resorts on our list aren’t in abundantly beautiful and adventure-filled locations, we just got really excited when we saw where Nelson’s Resort has been hunkered down for more than 75 superb years. Not only does this historic haven feature things you wouldn’t expect to find at a classic lake resort, much less at a five-star city hotel, its proximity to some of Minnesota’s grandest natural elements makes it a must-stay for anyone searching out a Northwood’s destination. Here, Nelson Resort will accommodate you any way you deem fit for an up North escapade. If that means all you need is a boat, a fishing pole and a roof over your head at night, it’s done. And if it means a nightly organic-style meal picked fresh from a blooming garden and a bottomless glass of aged port after a day lazing on a luxury cruise boat, you can have that, too! Nelson’s Resort’s onsite Millie’s Garden grows leafy delicacies like curly ornamental kale, savoy cabbage, butterhead lettuce, asparagus and parsley. From the Twin Cities, take I-35 North to Cloquet. Exit at the Range Cities sign. Continue through Cloquet on Hwy. 33. Hwy. 33 merges into Hwy. 53 and 53 North takes you through the city of Virginia and further north through Cook and Orr. Turn right at the stop light in Orr on 23. Turn right on Nelson Road which will lead you to Nelson's Resort. 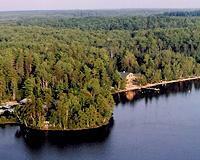 The Boundary Waters Canoe Area Wilderness and Voyageurs National Park are only minutes away from Nelson’s Resort. Surrounded by more than one million acres of wilderness, it's safe to say Timber Trail Lodge & Resort is an outdoor oasis. And, you can explore this almost infinite space all year round at this four-season resort. Grab your family, your friends, or just yourself and get away! Situated on the south shore of Farm Lake, this family fun center offers an authentic Minnesota getaway. Enjoy motorized boating on Farm Lake or any of the other three interconnected lakes on the White Iron Chain of Lakes. Slow things down with a soothing canoe trip on the Boundary Waters, which you have direct access to. Family fishing fun is always in full supply, as Timber Trail provides the bait, tackle, and boats needed to reel in walleye, northern pike, bass, lake trout, and pan fish. Stay dry and hike through the pine-lined trails, soak in the scenery on a float plane ride, or head into Ely for some shopping. The rustic cabins allow you to soak in the simplicity of this beautiful region while also featuring amenities like handcrafted log furniture, wood patios overlooking the lake, picnic tables, and more. Come experience the majesty of Minnesota! Observe black bears in a natural setting at the North American Bear Center or learn about the last person to live in the Boundary Waters at the Dorothy Molter Museum. When the winter wonderland arrives, get to know the snow! Snowmobile through miles upon miles of trails, embark on a dog sledding adventure, or cross country ski through the powdery landscape. Located right next to to immaculate Lake Birch, Timber Bay Lodge & Houseboats is the perfect place to escape life's hustle and bustle and spend some quality time with the family. After a weekend on the shores of Lake Birch, your family will be hard-pressed to leave without a smile. Named Minnesota Resort of the year in 1998 and 2012 by the Minnesota Resort Association, Timber Bay is most often enjoyed inside the cabin of one of their luxurious houseboat rentals. Before you go, be sure to grab a fishing rod to test your skill at landing a walleye, northern pike, or crappie, all from the comfort of your boat abode. Fish not biting? Cannonball off the side and into the crystal-clear water. And at night, anchor in a secluded section of Birch Lake and let the gentle waves rock you to sleep. Of course, boating might not be for you. 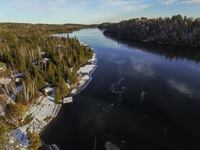 If that's the case, go on a hike through the Norway Pine forest that surrounds Timber Bay, or bike to Babbitt or the public beach on one of the many paved trails. Bicycles are available at the resort at no charge! Afterwards, return to a rustic cabin and enjoy some stargazing from the porch. Whatever floats your boat, Timber Bay is happy to accommodate. As of the 2010 census, Ely's population was 3,460. Ely is also home to the International Wolf Center and the North American Bear Center. Both are organizations dedicated to educating the masses and serving as ambassadors for their respective species. Give them a visit if you're in the area! With its rustic atmosphere, Cascade Lodge excels at connecting guests with Mother nature,. Add in their superior hospitality and cozy accommodations, and you have a can't-miss cabin destination! Step outside your door and take in the majesty of Lake Superior. The world is your oyster here, whether you're looking for fishing, boating, or a wealth of water sports. If you're less nautically-inclined, nearby you'll find Cascade River State Park and Superior Hiking Trail, both exceptional for exploration. At the end of the day, return to your rustic log cabin, where you'll enjoy a wood-burning fireplaces, a whirlpool, and scenic views of the spectacular north shore! Lake Superior is the largest freshwater lake in the world by surface area, meaning you'll find plenty of space for water-fueled fun! The onsite restaurant serves up wide variety of breakfast options, soups, salads, sandwiches, and several steak, poultry, fish and pasta dinner selections. Campfire Bay is only a short two hour trip from the Twin Cities, but its so secluded and peaceful you'd never know it! It's no wonder why folks have flocked to Campfire Bay since 1947- the gorgeous cabins and rustic surroundings of Fish Trap Lake make for an unforgettable experience. Whatever outdoors-related activity is your vice, you'll find a paradise here. Fishermen find abundant hotspots right off the shoreline. Avid hikers have a cornucopia of trails to blaze. And the cabins- oh the cabins! There are two, three and four bedroom cabins onsite, perfect for almost any sized family. Amenities are plentiful and include (but are not limited to) a/c, full kitchens, decks, comfy outdoor furniture and a community bonfire pit where you can get to know the other visitors. We'd call it paradise- and you will too! Located in beautiful Park Rapids, Half Moon Trail Resort is utterly dedicated to making sure that you and your family have an experience you’ll be bragging about for years. Settle into a rustic cabin and enjoy the soothing sounds of the lake (and crickets) while you gently drift off to sleep. When you wake up, catch the sun rising over the lake and get ready for nonstop fun. Tubing, waterskiing, and pontooning are all very popular, or you could just sit on the huge sandy beach and enjoy the weather. Of particular note is the resort’s extensive gardens, set amidst towering pines and full of fragrant varieties of flowers. An idyllic setting for an idyllic place! Nestled on the north shore of Little Mantrap Lake on a quiet peninsula, Little Norway Resort brings all the charm of Oslo to a beautiful Minnesota setting! 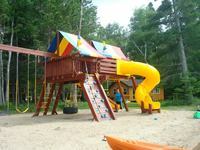 As Park Rapids' premier full-service family resort, Little Norway Resort has a great deal of expectation put before it. And it succeeds with flying colors! If you're interested in the outdoors (and who isn't? ), Little Mantrap is an excellent fishing lake and its crystal clear waters are ideal for spotting the big one. The resort and cabins are filled with many amenities that you'd expect from a huge commercial resort, but here they're served with patented Minnesotan hospitality. Take our word for it- you'll never want to leave! The resort is 1.7 miles from the entrance to Itasca State Park and 17 miles from downtown Park Rapids. Other amenities include two playgrounds, volleyball nets, and a basketball court. Located in the secluded splendor of a protected bay, Cozy Bay Resort offers a combination of relaxation, rejuvenation, and recreation. Whether you're in search of cabins or camping, you'll find an array of options here. These rustic yet refined cabins are furnished with modern pieces and showcase fire pits, picnic tables, and more. Get close to nature at a campsite and enjoy water, electricity, and campfires. Unwind in your rustically modern cabin, set off for lake activities, or hike through the untainted wilderness at this family-friendly stay! Best of all, you're always just a few footsteps from Lake Edward, where aquatic adventures abound. Rent a kayak and explore the shores, set off on a fishing trip, or splash around in the sectioned swimming area for kids. Stay dry and hike through the tree-lined trails, pedal the paved bike trails, or swing away on the nearby golf courses. Play volleyball and tetherball outside or head into town and explore the unique antique shops. Your Minnesota cabin getaway awaits! Rent a motorboat and cast off on a fishing expedition for walleye, northern, bass, or panfish! Stop by the game room and play a game of pool or video games. Afterward, munch on snacks and pop. When it comes to cabin getaways, Sand Lake Resort just might be the ideal place. It combines beautiful accommodations with the superb outdoors! Whether you're spending your time swimming in Sturgeon Lake, hiking the beautiful countryside, or simply catching a nap in a hammock, the outdoors are simply special at Sand Lake Resort. There are seven distinct cabins to choose from here, fitting up to six people at once. Bring the family, some friends, or your significant other and partake in one of the plethora of activities the resort facilitates! Hiking, biking, bird-watching.. whatever you choose, you'll have a immensely fun time doing so! Set on the sparkling backdrop of scenic Pelican Lake, Birch Forest Lodge has 11 exceptional cabins that are always ready to host fun-seeking families! The only question is who’s going to love the resort more; you or your kids? Get out this summer for a classic Minnesota cabin weekend at Birch Forest, where the activities are fun both in the lake and out. Many cabins are newly remodeled and features all the modern amenities you’d expect from a quality resort. Of course, you’re here for some fun in the sun, and that you’ll surely do! Hit the fantastic swimming beach and play some volleyball or cannonball off the dock, explore the lake in a canoe, kayak, or paddle boat, or just grab a rod and reel and do some relaxing fishing. Pelican Lake is going to be your new favorite place. The lodge is 50 miles north of Virginia, MN. Elbow Lake is well-known throughout the midwest as a pristine natural wonderland and as a fantastic vacation destination. 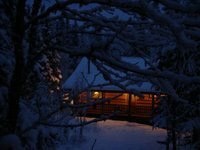 That reputation is partly due to the incredible experiences provided at Elbow Lake Lodge. Whether you’re cannonballing into the lake or roasting marshmallows over a crackling fire, the fun doesn’t stop at the Elbow Lake Lodge. From its homey rooms to its hospitable employees, you’ll be in heaven from when you arrive til you depart. One, two, and three room suites are available, or (for big families) grab a rustic cabin. When you aren’t getting cozy in your dwelling, go for a boat ride or play 18 at the lodge’s own mini golf course. Don’t just have a run-of-the-mill vacation; have an Elbow Lake vacation! There is over 800-feet of beach on the property! A nature-lover’s dream, Whaley's Resort & Campground is home to everything you could want from a Minnesota cabin vacation. Bring your family, your friends, or just yourself and make some memories. Whaley’s is well-known as a haven for private, peaceful vacations. Whether you’re looking for a radiant campground or a cozy resort, this is the place to be. Get out on the miles of trails and sandy swimming beach for some exercise, or sit back and try out the terrific fishing or pontoon rides. Each of the 14 cabins and 4 villas is unique, rustic, and full of rustic decor. You’ll feel right at home, without a doubt. Minnesota's population was 5.457 million as of 2014. Lake Itasca is the headwaters of the Mississippi River. Located in Minnesota's beautiful Lake of the Woods awaits an incredible vacation experience for family, friends, and couples alike. Arnesen's Rocky Point Resort on the south shore of the Lake of the Woods features a selection of charming cabins, breathtaking lake views, and plenty of exciting outdoor activities for adventure-lovers of all ages! Their cozy housekeeping accommodations feature complete kitchens with utensils, satellite television, barbecue grills, picnic tables and much more. Choose from a selection of one to four-bedroom units and enjoy all the comforts of home during your stay! When you're not taking it easy in your home-away-from-home, you'll love all the exciting activities just outside your door. Arnesen's features the largest protected marina on the south shore, along with a wide sandy beach area perfect for swimming. Take out a boat for a day of fishing and reel in options such as walleye, northern pike, sauger and perch. Or, you can explore the surrounding area on a hiking trip. The Lake of the Woods is full of ruffed grouse, waterfowl and deer. No matter what you choose to do, your comfortable cabin awaits at the end of the day! 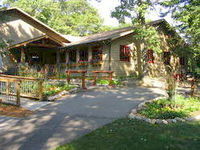 Make Arnesen's the destination for your unforgettable Minnesota vacation today! After a long day of adventures, relax at the Rock Harbor Lodge for a delicious meal. The restaurant offers beautiful views of the Lake of the Woods and a wide selection of incredible courses to choose from to satisfy any craving! Arnesen's Rocky Point Resort also offers seasonal lots and a large campground for a more rustic vacation experience! Don't be just another guest during your next Minnesota Cabin Getaway! At Boyd Lodge you are a part of the family, and you'll be sure to enjoy the friendly atmosphere throughout your stay. Specializing in family vacations, couple's packages and group resort getaways surrounded by the Northwoods beauty of Minnesota, Boyd Lodge offers four seasons of fun in Crosslake. During the summer you can enjoy a dip in the pools, or one of the 14 lakes in the Whitefish chain. Winter brings about its own set of activities including cross-country skiing, snowmobiling, and snowshoeing. After all, you have to expect a little bit of the white stuff during a Minnesota winter. Regardless of the season you're traveling, you'll enjoy your comfortable accommodations so much you may have to extend your stay. 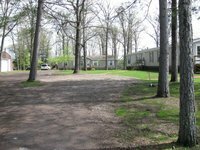 Your choice of cottage or cabin features a wood burning fireplace, an outdoor BBQ grill, a fully equipped kitchen with microwave and dishwasher, cable television, and even WiFi internet access. Three to five bedrooms will ensure everyone in your group has enough space to stretch out and relax. From the Twin Cities take Interstate 94 west to Clearwater. Exit at Clearwater and go east 4 miles to Clear Lake. At Clear lake go North on Hwy. 10 through St. Cloud and Little Falls. North of Little Falls take Hwy. 371 through Brainerd, Nisswa and Pequot Lakes. North of Pequot Lakes 2 miles is County Road 16. Take County Road 16 east 9.5 miles to Silver Peak Road. Take left. Boyd Lodge is 1/2 mile on left. In 2014, Boyd Lodge celebrated the property's 80th Anniversary. Lynn and Ceil Boyd originally opened the lodge in 1934, and their daughter Nancy took over operations of the resort in 1967. Set squarely on the banks of Bad Axe Lake, Isle O' Dreams is the ideal cabin getaway for outdoor lovers and full of family-friendly activities! This historic 1930's lodge features 17 cabins along 2,000 feet of majestic shoreline. Whether you are looking for a cozy bungalow to sleep after a day of fun activities, or need space for the entire extended family, Isle O' Dreams has accommodations to fit your needs. The fun never stops during your trip to the lodge with outdoor games, bingo and putting contests throughout the week. Enjoy a Bonfire at the Lodge with S'mores provided from 8:45 to 9:15, or amaze your entire family at Karaoke Night! With all of these exciting organized activities, do not forget about the natural playground that awaits in the form of Bad Axe Lake. Whether you are taking a boat or kayak out onto the water, or casting your fishing line from the shore, there is plenty of fun to be had! Experience a remarkable Minnesota Cabin Getaway and plan your stay at Isle O' Dreams Lodge. With 17 cabins, Isle O' Dreams is sure to provide you with the accommodations of your dreams. The Eagle and Lake Home cabins are both four-bedroom units with room for 10 people. But, If you are looking for a truly unforgettable group experience, try the nine-bedroom Martin Family Reunion Complex featuring two large decks and a private swimming raft. Known as a Naturally Superior Destination, Ely’s River Point Resort & Outfitting Co. may be our No. 12 choice on our list of Top Minnesota Cabin Resorts, but it should be your No.1 choice if you have your heart set on investigating the Boundary Waters Canoe Area Wilderness. Ranked as one of the top four Minnesota Resorts in Midwest Living Magazine, this up North getaway takes an incredible secluded wilderness peninsula, an unspoiled, 20-mile shoreline and a plethora of luxury cabins, villas and chalets and makes your lakehome dreams come true. You’ll be begging to make a beeline to this Birch Lake gem as soon as you see the meticulously-kept grounds and its closeness to Minnesota’s glorious parks. With the Boundary Waters Canoe Area at your doorstep, River Point Resort & Outfitting Co. makes it easy to explore the beautiful surroundings during the day and return to the resort to sleep soundly and safely at night. Of course, the more adventurous traveler might find it more satisfying to join in on the resort's spectacular overnight canoe trips, which take you along the waters during the day before setting up camp on the shores of the South Kawishiwi River and Birch Lake. It's the perfect way to experience all that this natural destination has to offer! River Point Resort was featured in Lifetime Fitness Magazine! From the Minneapolis/St. Paul area, follow 35W north to Hwy. 33 through the city of Cloquet. Hwy. 33 turns into 53. Follow Hwy. 53 to the outskirts of Virginia. Continue on 53 to the point where 169 joins it. Follow the signs and 169 North to Ely. Travel east through Ely on 169 and 1. Turn right onto Hwy. 1 and cross over a large bridge (Birch Dam). Take the first right turn onto River Point Road. River Point's private dirt road will be up ahead. Birch Lake covers more than 6,000 acres and is 20 miles long. Tucked away in Voyageurs National Park, on the shores of Lake Kabetogama, is the family friendly cabin resort Northern Lights. Choose from any of 12 unique cabins for your visit to the lake. The kids will go nuts for the floating waterpark. You’ll enjoy the solitude of 65 miles of uninhabited wilderness off the dock from one of Minnesota finest fishing lakes. And, if you don’t have a boat or equipment, Northern Lights has all the fixings readily prepared for your lake adventure. Lake Kabetogama's crown jewel, Northern Lights Resort is calling your name! Fishing at Lake Kabetogama is an unforgettable experience. The lake is teeming with a variety of species including walleye, northern pike, smallmouth bass and pan fish! Top off your northern Minnesota vacation with a chance to experience the Northern Lights in person! The stunning natural phenomenon occurs around 200 times a year here so you're sure to catch sight of it during your stay! Although the No. 17 pick on our list of Top Minnesota Cabin Resorts is located in the land of Paul Bunyan, it’s no tall tale that Samara Point Resort boasts one of the most desired spots on Gull Lake; in fact, it’s enough to make Babe the Blue Ox turn green with envy. 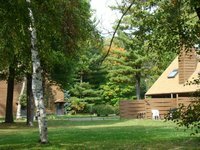 Thick woods and lush, leafy canopies set the stage for Samara Point and your Brainerd vacation. Eight inviting cabins speckle the grounds and serve as your home base during your stay on Gull Lake. We couldn’t decide whether to jump into the cool lake waters, hop in our complimentary boat and peruse the waves for the perfect walleye and northern pike fishing spots or just take it easy in front of our cabin’s rustic wood-burning stove. So we did all three, and you will too! Samara Point is truly a place to just sit back and enjoy Minnesota’s glorious terrain. And if you’re lucky, you may even get to dip your feet in the lake with the friendly blue herons, known for their frequent dockside visits! Samara Point Resort offers eight rustic, well-appointed cabins for families of up to eight. From Brainerd, drive north on U.S. Highway 371. At the second entrance to County Road 77/Bar Harbor Road, turn west and drive until you see a sign for Samara Point to the left and the City of Lakeshore sign on the right. Turn left at Birchwood Hills Road and Samara Point will be up ahead. Gull Lake is one of Brainerd’s largest lakes! If Zipple Bay was just 12 miles to the east, we’d have had to write a whole new Canadian top list. Lucky for us, this Lake of the Woods wonderland sits cozily in U.S. territory as one of the North Star State’s own! As the only resort on Zippel Bay, this 20-cabin Northwood’s haven has a lot to live up to – so we mean it when we say this place a real catch! And you’ll surely have more than one big catch when you tap into Lake of the Woods’ world-class walleye and sauger fishing. Bring home the bacon – err, fish sticks – after a daylong cruise on the 30-ft. walleye fishing charter boat. 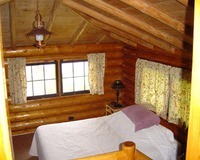 And we couldn’t forget to talk up the luxury log cabins; after all, it is on our list of Top 10 Minnesota Cabin Resorts! These aren’t your typical smallish cabins clinging to the water’s edge. The enormous natural Norway pine log cabins are more than comfortable. With rooms big enough to store your boat in, you and your family members are guaranteed a good night’s rest on your Zippel Bay vacation! 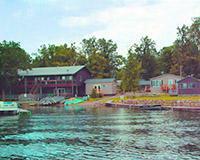 Besides walleye, Zippel Bay is also known for its excellent smallmouth bass and perch fishing. Lake of the Woods features the highest walleye/sauger limits in Minnesota! The four-bedroom Outpost Cabin is perfect for hunters. This cabin is located in the Beltrami State Forest, teeming with white-tail deer. If you’re looking for a family-oriented resort that offers cabin year-round? Well, despite your oddly-specific request, we’ve found the perfect place for you: Golden Eagle Lodge. Fully-equipped modern cabins dot the property, each full of its own unique charms and features. “Unspoiled and unforgettable” is what the Golden Eagle website describes them as, and they’re not lying. Whatever season you decide to visit, Golden Eagle will have plenty of fun waiting for you. Go fishing, hiking, sightseeing, and canoeing in Summer or Nordic Cross-Country Skiing in Winter; regardless, you and your family will have a fantastic time. The population was 1,351 at the 2010 census. The Gunflint Trail begins in Grand Marais and heads northwest, away from the lake and into the Boundary Waters region. Come to beautiful Nevis, Minnesota, where the family fun is just as good as the weather (which is fantastic)! And when you come to Nevis, you'll want to stay in the premier place to experience it: Beauty Bay Lodge & Resort. Beauty Bay Lodge is a charming family-friendly getaway that offers a selection of cozy cabins, each just steps away from the shores of beautiful Lake Belle Taine. Cabins are well-furnished and full of all the comforts of a home, including a kitchen, living room, sleeper sofa, and private deck looking out over the lake. When you aren't relaxing inside, you'll be out and about exploring all that the area has to offer! Spend your time exploring the waters on a boat, fishing or cannonballing in when the mood strikes. Or go on a hike on one of the multitude of nearby trails, keeping a lookout for wildlife along the way! Some drive through Nevis, Minnesota, and think it's like any other small town. But for many, driving through Nevis is cause for celebration; it means you're almost at Anderson's Starlight Bay Resort. With the backdrop of beautiful Crow Wing Lake, Anderson’s Starlight Bay Resort is a must-stay destination for all, whether you're a couple seeking romantic solitude or a squabbling family on a summer trip. Cabins are spacious and cozy, set right next to the lake so as to From the cozy interior of your cabin, set out and explore your gorgeous surroundings. When you aren't swimming, fishing, or boating on sparkling Starlight Bay, you'll be observing the bountiful wildlife, including songbirds, turkeys, eagles, deer and other small woodland critters. Your family (and you) will absolutely love it. The northern pike, walleye, and largemouth bass fishing is second to none here!